Free Tibet! Vive le Tibet libre! 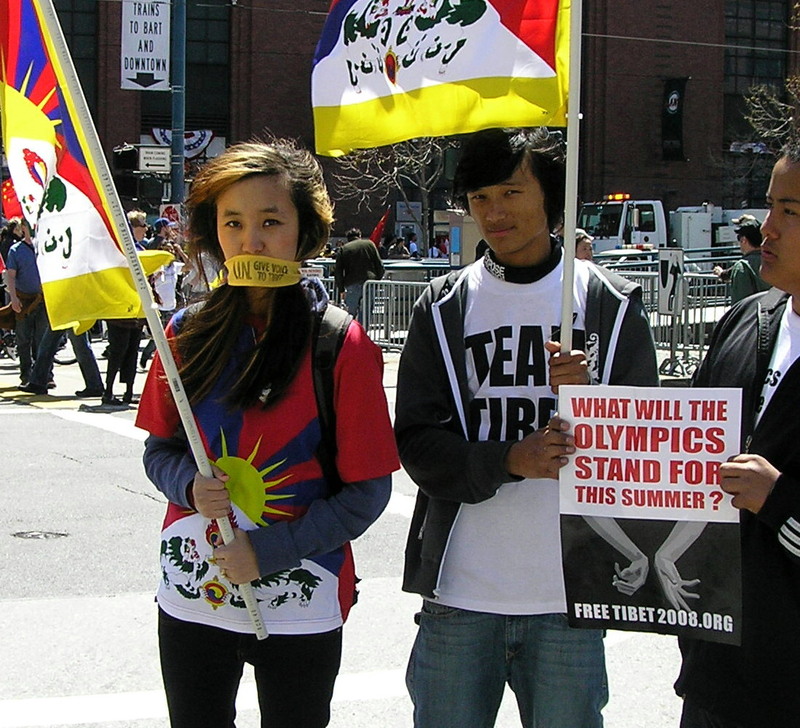 The signs for FREE TIBET kept popping up all over the place in the last few days! But the Olympic Torch zipped thru the city of San Francisco, one minute you could see it and the next minute you couldn't; the whole affair was heavily guarded and protected, there was much secrecy and last minute change of plans and creative re-routing and then it was gone. As far as managing this passage of the Torch within the City without arrests and destruction and anybody getting hurt, then I guess, Yes, it did work - and that's a big deal in view of the recent London and Paris problems. As far as staging a public run of the Olympic Torch throughout the City to represent the spirit of rallying people thru sports and good will, then I would say, it failed completely. 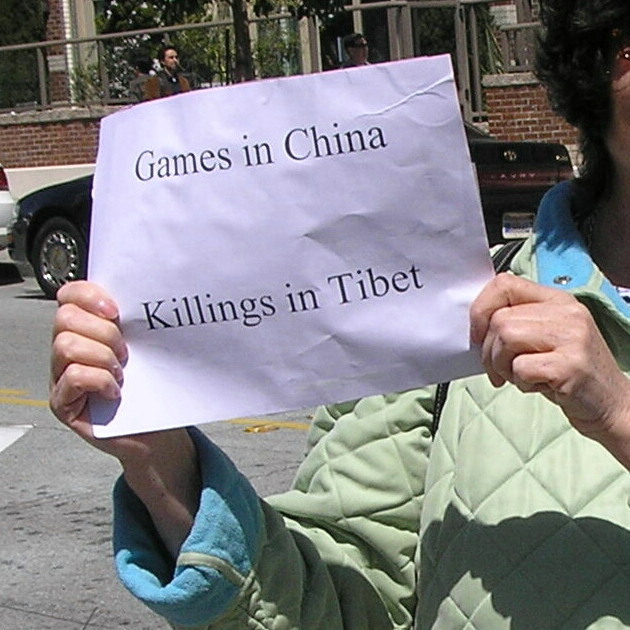 But the City is not to blame for this, much has been placed at the feet of the Chinese Government because of its recent crackdown in Tibet and because of China's long story of human rights abuse. 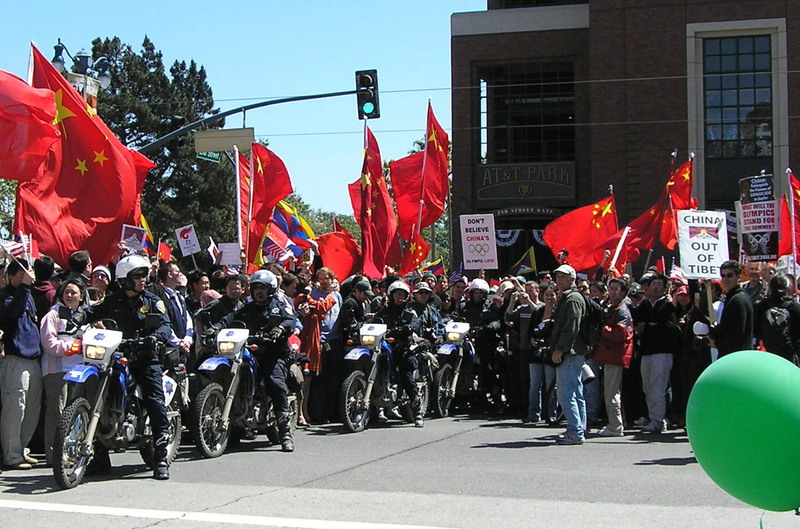 In the West, there is a certain ambivalent feeling toward China because, on one hand, the Games of 2008 in Beijing are a very positive sign toward a more open and vibrant society but, on the other hand, you can't just brush off the hard reality of a communist regime and what it has done and what it continues to do. 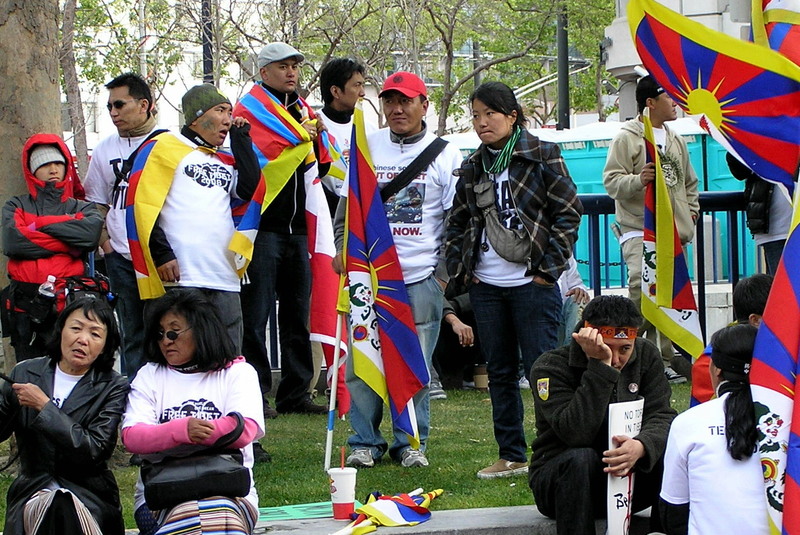 I happen to be very fond of Tibet and long for its people to get the freedom and justice they deserve. And that is why I went to the Tuesday night peaceful rally at the UN plaza. 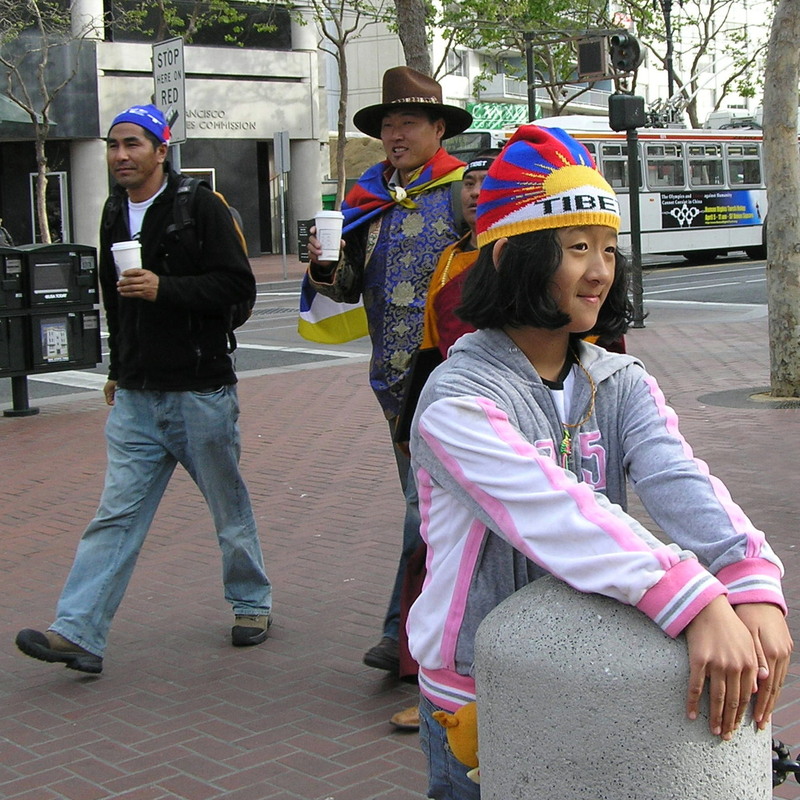 I ended up leaving early but I took a few pictures of Tibetans hanging around in the cold San Francisco wind, holding Tibetan flags and Free Tibet signs. It looks to me they have been waiting for a long time. I pray for them. On the day of the passage of the Torch, I went to PacBell Park and took a few more pictures but I never got to see the Torch itself since it was doing its little disappearing act. I was disappointed but I wanted to be there to take a peaceful stand for freedom and I was able to do that. As a devout Catholic, I enjoy greatly the freedom of worship that I experience right here in the West and I am well aware of the persecutions that the Church is going through in China. Forced underground, hundreds and hundreds of faithful harassed, many in jail, the record is appalling. There is no religious freedom and there is no freedom of press and the two go together like 2 peas in a pod. The Chinese people themselves are very courageous and have endured so much that I cannot help but wish them a future full of hope and fruitful changes. I pray for them too. I was feeling a bit discouraged last night and I wondered whether anything could really change soon. Some of our own interest in China is not without cupidity and greed and I was worrying about it. The strangle-hold that the communist regime has on its own people was disheartening to me but then I remembered the boycott of the Moscow Olympic Games in 1980 and the Berlin Wall coming down in 89 and I have no idea what is going to happen next but I am praying because everything is possible with God's grace! I pray for the opening of a dialog between the Chinese Government and the Dalai Lama. I pray for freedom and justice in Tibet, the roof of the world. I pray for a complete opening to democracy for China and the freedom of press and the freedom of religion that it entails. And I especially pray that we will, us in the West, use and promote this very freedom and justice and prosperity that I am talking about, that we will exercise it again and again ourselves in our own affairs, here and abroad, today more than ever before. Because the truth is that although we have put in place the very structures that support this freedom, it is a process that needs constant examination and assessment. May God give us the courage and the discernment to do it! here on Voice of the Martyrs. St. Francis Xavier, pray for us, pray for all of us, whether we are in the East or in the West! On 7 April, 1541, Francis Xavier embarked in a sailing vessel for India, and after a tedious and dangerous voyage landed at Goa, 6 May, 1542. The first five months he spent in preaching and ministering to the sick in the hospitals. He would go through the streets ringing a little bell and inviting the children to hear the word of God. When he had gathered a number, he would take them to a certain church and would there explain the catechism to them. He devoted almost three years to the work of preaching to the people of Western India, converting many, and reaching in his journeys even the Island of Ceylon. In the spring of 1545 Xavier started for Malacca then in January, 1546, Xavier went to Molucca Islands, and for a year and a half he preached the Gospel to the inhabitants of Amboyna, Ternate, Baranura. By July, 1547, he was again in Malacca and met a Japanese called Anger (Han-Sir), from whom he obtained much information about Japan. His zeal was at once aroused by the idea of introducing Christianity into Japan. He arrived in Kagoshima on 15 Aug., 1549. The entire first year was devoted to learning the Japanese language and translating into Japanese, with the help of Pablo de Santa Fe, the principal articles of faith and short treatises which were to be employed in preaching and catechizing. During 1551 he preached in some important cities, forming the nucleus of several Christian communities, which in time increased with extraordinary rapidity. After working about two years and a half in Japan he returned to Goa, arriving there at the beginning of 1552. Xavier turned his thoughts to China, and began to plan an expedition there. During his stay in Japan he had heard much of the Celestial Empire, and he understood how wide a field it afforded for the spread of the light of the Gospel. At Malacca the party encountered difficulties. While planning the best means for reaching the mainland, he was taken ill, and as the movement of the vessel seemed to aggravate his condition, he was removed to the land, where a rude hut had been built to shelter him. In these wretched surroundings he breathed his last. It is truly a matter of wonder that one man in the short space of ten years (6 May, 1542 - 2 December, 1552) could have visited so many countries, traversed so many seas, preached the Gospel to so many nations, and converted so many infidels. The incomparable apostolic zeal which animated him, and the stupendous miracles which God wrought through him, explain this marvel, which has no equal elsewhere. The list of the principal miracles may be found in the Bull of canonization. St. Francis Xavier is considered the greatest missionary since the time of the Apostles, and the zeal he displayed, the wonderful miracles he performed, and the great number of souls he brought to the light of true Faith, entitle him to this distinction. He was canonized with St. Ignatius in 1622. The body of the saint is still enshrined at Goa in the church which formerly belonged to the Society of Jesus. For the complete page on Saint Francis Xavier see here on New Advent, the Catholic Encyclopedia.